Chiquita made a killing from Colombia’s civil war. Will their victims finally see justice? A long-running case against the banana giant is moving forward in U.S. court. Getting an interview with Anabel (not her real name) is not easy. In Colombia, witnessing paramilitary violence against your family generally means you keep quiet about it—it’s too dangerous to speak about what you’ve seen. Anabel tells us, after an extended period of negotiation, to meet her at her place of work near the trendy El Poblado district of downtown Medellín. We are told we cannot name her: What she saw and the powerful people who are implicated mean her own life is still not safe. By the 1990s Chiquita had significant operations in Urabá, the subregion where Anabel was living with her mother and stepfather. They were giving millions of dollars to mass-murdering paramilitaries, who had been emboldened by political protection during the civil war, to help protect their assets from dissidents and their operations from unionists. The major paramilitary group in Colombia, the AUC, has a long history of violence against peasants, trade unionists, Afro-Colombians and indigenous communities. Chiquita has admitted that it made at least 100 payments to the AUC in the period from 1997 to 2004, a total of $1.7 million. In March 2000, internal Chiquita communications noted the connection between the convivirs and the AUC, revealing that Chiquita chose to “continue making the payments [because they] can’t get the same level of support from the military.” At the time these paramilitaries were regularly killing and dismembering people all over Colombia. Often the people they killed were opponents of big resource projects. Chiquita claims it didn`t know what its money was being used for. “The corruption is not just normal bribery. Colombian corruption is relationships,” says Collingsworth. For example, Jaime Bernal Cuéllar, a lawyer on retainer for Drummond in Colombia, was a law partner for years with former Colombia Attorney General Eduardo Montealegre Lynett. They have written books together and, Collingsworth tells In These Times, Bernal is the godfather to at least one of Montealegre’s kids. It`s hard to see Montealegre launching a case against Drummond. 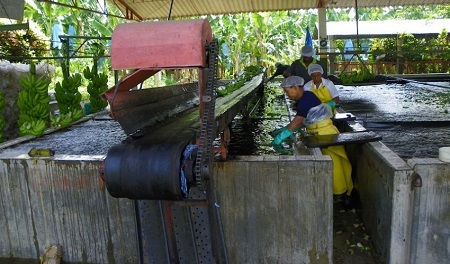 Photo: Workers wash bananas on a plantation in Magdalena, Colombia. Source: J. Stephen Conn/Flickr.